Cambridge ICT Starters: Next Steps, Stage 1 has been designed to support learners who are following the Cambridge Information and Communication Technology (ICT) Starters syllabus. This book provides full coverage of all the modules. The sections of the book correspond to the modules and follow the order in which the modules appear in the syllabus. The book builds on creating, amending and refining documents; designing cards and posters; producing, amending and interpreting spreadsheets and graphs; and exploring, modifying and interpreting databases. 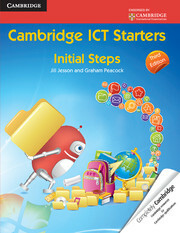 The activities in the book use Microsoft ® Office 2007 software and Windows ® 7. Module 3. Exploring Spreadsheets: 1. What is a spreadsheet?